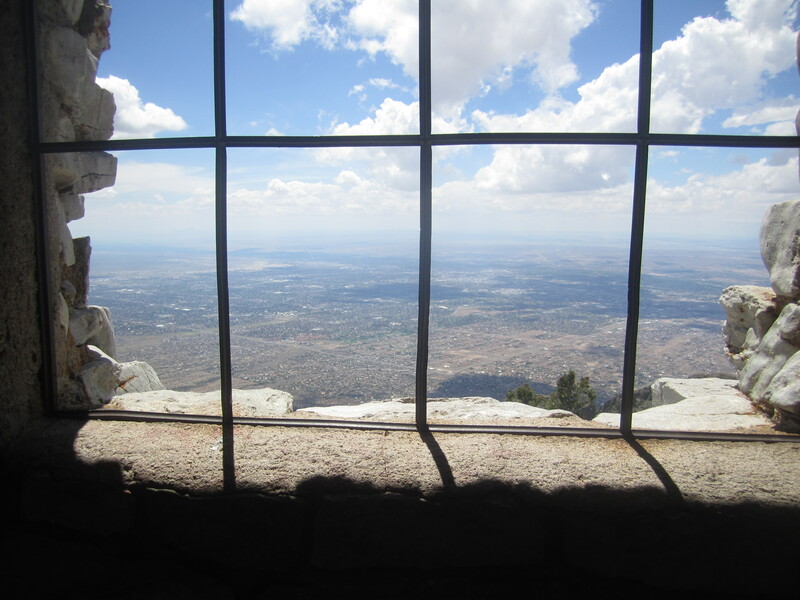 After riding a tram to the top of the Sandia Range, as documented in my last post, I was confronted with some tough choices as a hiker. It felt like the ad for a certain mini market chain: Too much good stuff! Luckily, an obvious hiking target arose quickly in the Kiwanis Cabin. It was visible a mile to the north along the edge of the ridge. It looked like a spectacular vantage point for photos. 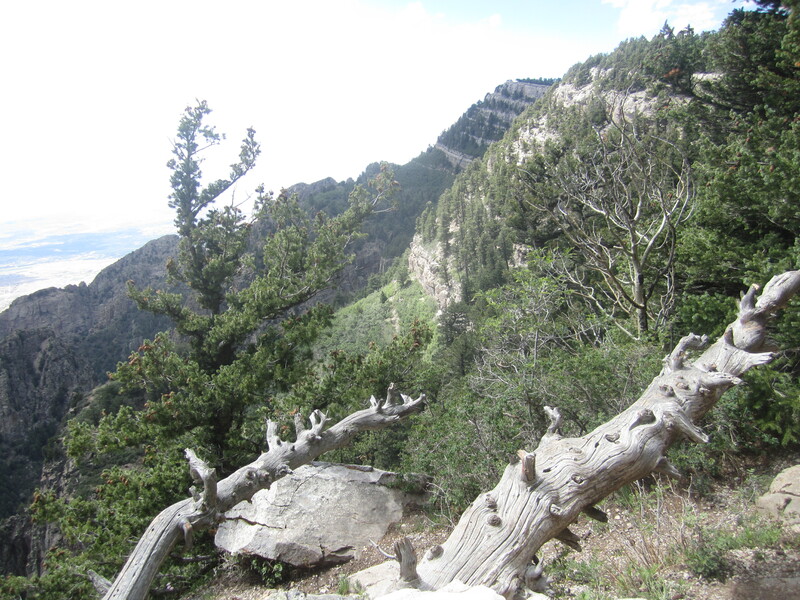 The first part of the Crest Trail heads at a casual pitch north of the area where the Sandia Peak Tram and the Sandia Peak Ski Area abut.In just a few steps there is a junction. The route to the left plunges into the abyss, clinging tenuously to the rocky scarp. 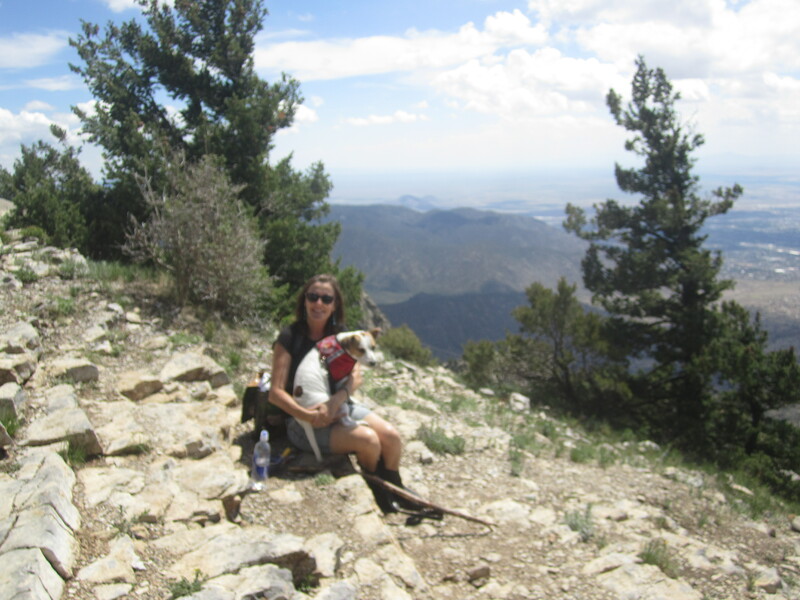 It reminded me a great deal of the upper third of the Bright Angel Trail in The Grand Canyon. A misstep in certain spots would send a hiker tumbling hundreds of feet. We were worried about our pup darting after a squirrel or bird, so we turned back toward the intersection and turned up the Crest Trail. There is a nature trail loop, but we stayed on the main trail, which offers a few stellar views to the west as we walked on limestone with what appeared to be fossils embedded. Denise wore cowgirl boots, and Jackie Chan was getting over being sick, so they turned around at one especially windy open slope. 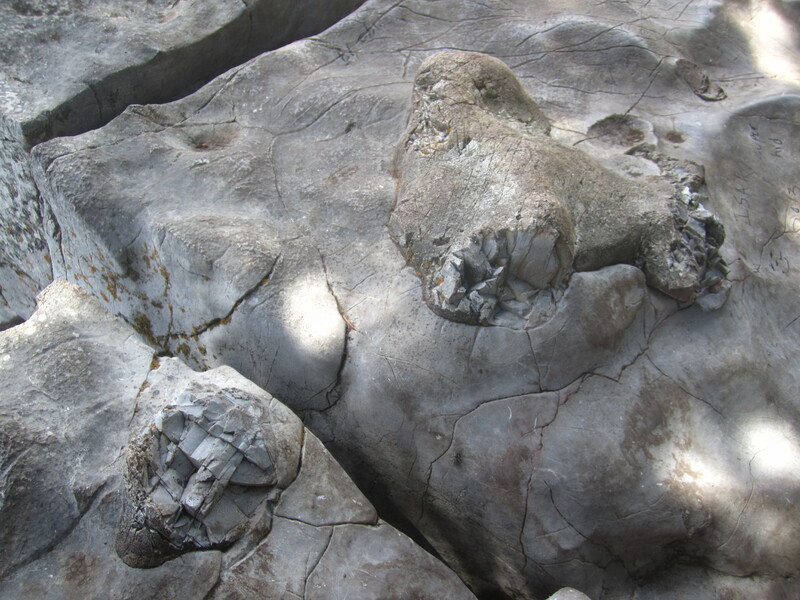 Crazy limestone. Disparate elements seem to be embedded in it. Fossils? Viewpoint near where I bashed my head on a sharp branch. Headache! After promising to hike quickly and return, I forged ahead in the woods, few other hikers nearby. Once I hit the other trails coming from the north, foot traffic started increasing. 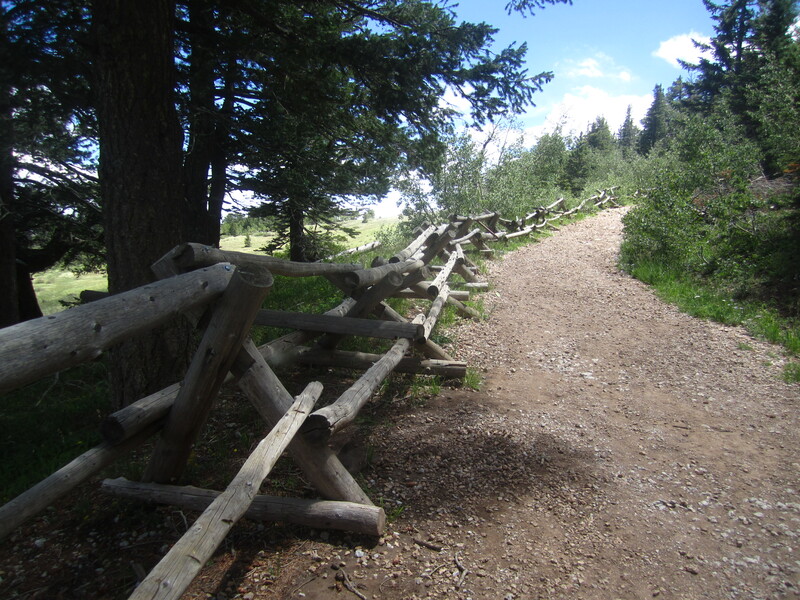 The route to the Kiwanis Cabin takes sections of a few trails to curve around a lovely alpine meadow mostly blocked off by split-rail fences. 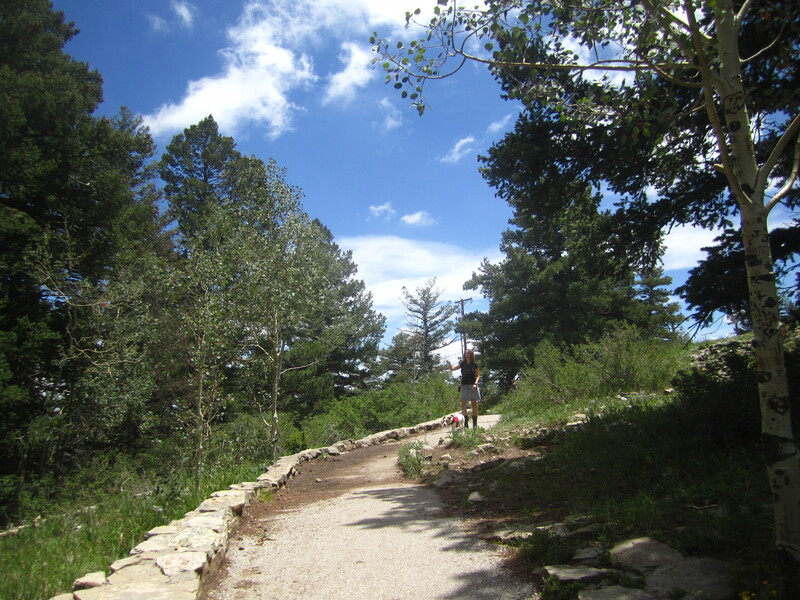 Apparently there once were multiple trails crossing the open area, but they were abused, and alpine areas take a long time healing from clumsy hikers and bikers, so the area was closed for restoration. 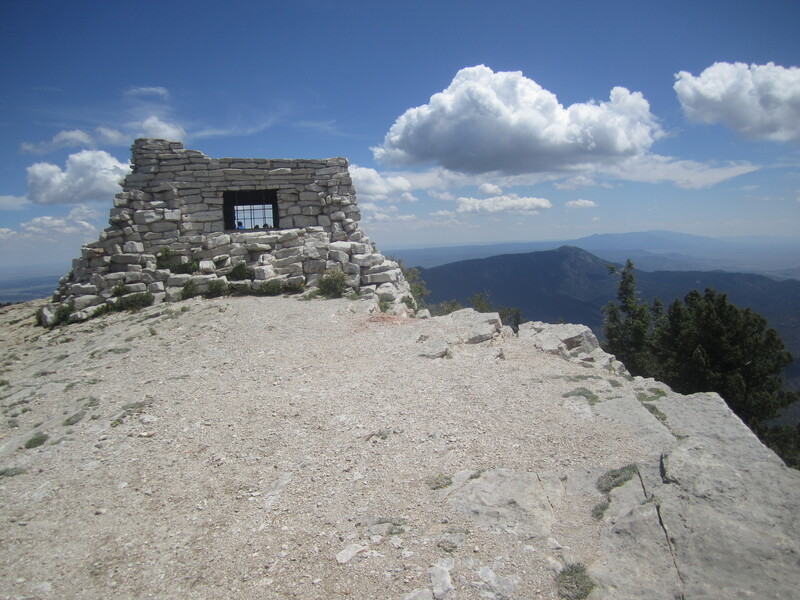 The hike is short anyway, and it was worth it to reach the sweeping views at the Kiwanis Cabin. The stone house was built by the Civilian Conservation Corps (CCC) in the 1930s as part of the New Deal to get people jobs and teach them skills. Mount Hood has a number of CCC huts built in the same time frame, a couple of which are still out there near the Timberline Trail. 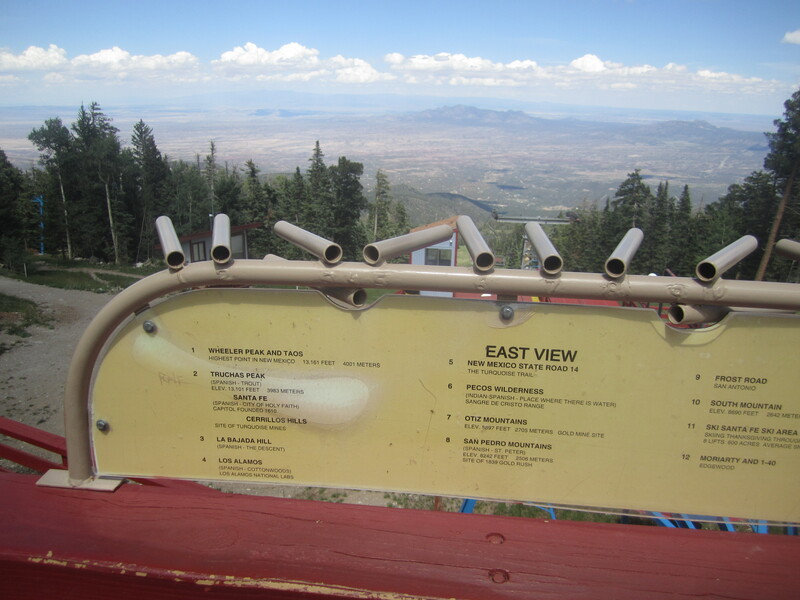 The Kiwanis Cabin was a casual 1.5 miles from the tram’s upper terminal. There is one short section where the trail climbed steadily and dealt with significant roots and rocks. Most hikers would be fine here, although the elevation might make it feel tiring. As my camera has dropped-by-owner disease, not all of my photos came out well. Hopefully in the next week or so I will purchase a new camera. Taken on the walk back. What an area. 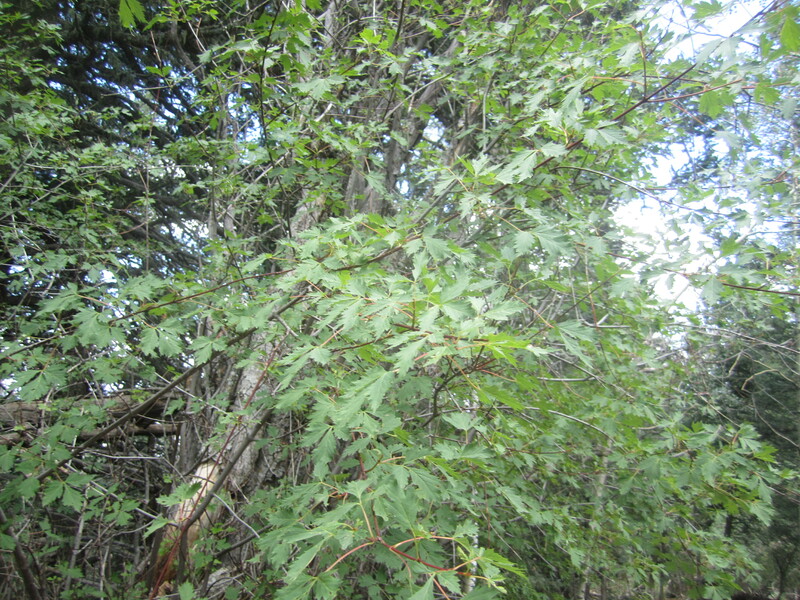 New Mexico Maple seems more like a Japanese Maple. Who knew? 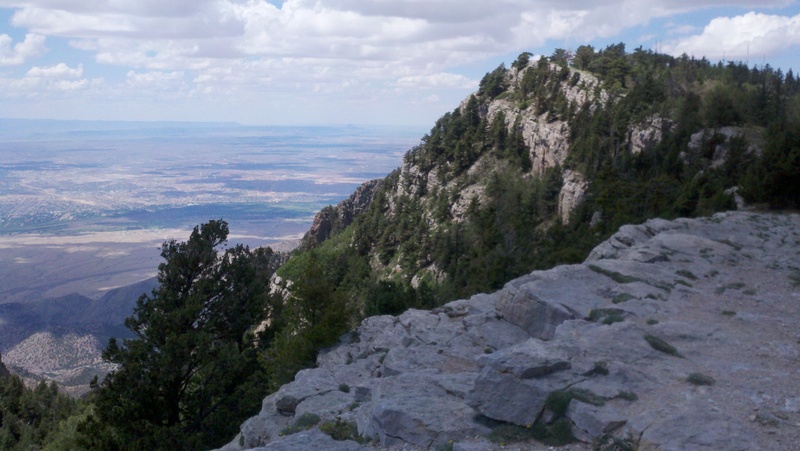 The Sandia Range is beautiful, easily accessible for most people, yet very rugged. This is highly recommended for any who want a classic island in the sky experience. There is nothing like being in a green forest and looking thousands of feet down at a brown and red desert landscape. We reconnect on the rocks near the tram terminal. That’s how we all start our hiking trips, right? 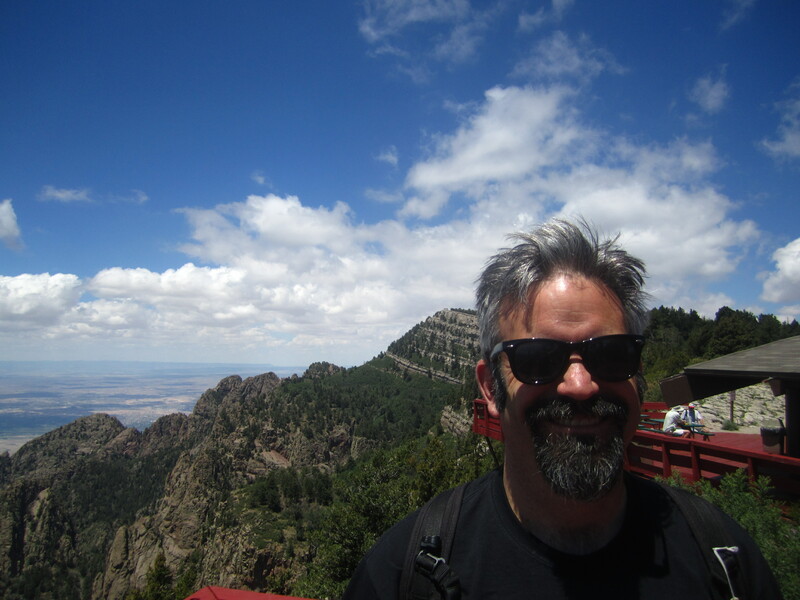 Normally I am a snob about easy ways to the top of a mountain, but I had a fantastic jaunt in New Mexico that began in this manner. In years past, I have scoffed at those who drove up peaks (Whiteface) or took a cog railway (Mt. Washington). Of course, that may simply have been jealousy. As I age, I find that I’m willing to take a few sweat shortcuts. Consider this post a testament to the short cut. To begin a trip into an alpine environment by taking a tram is a new experience, but the offer was too enticing to ignore. 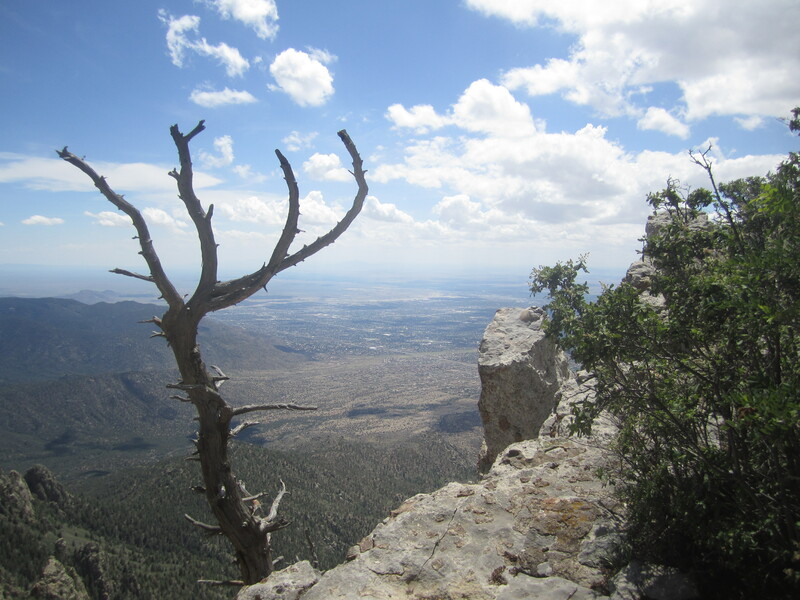 I’d heard of the Sandia Mountains for years, and had long wanted to hike or climb there. 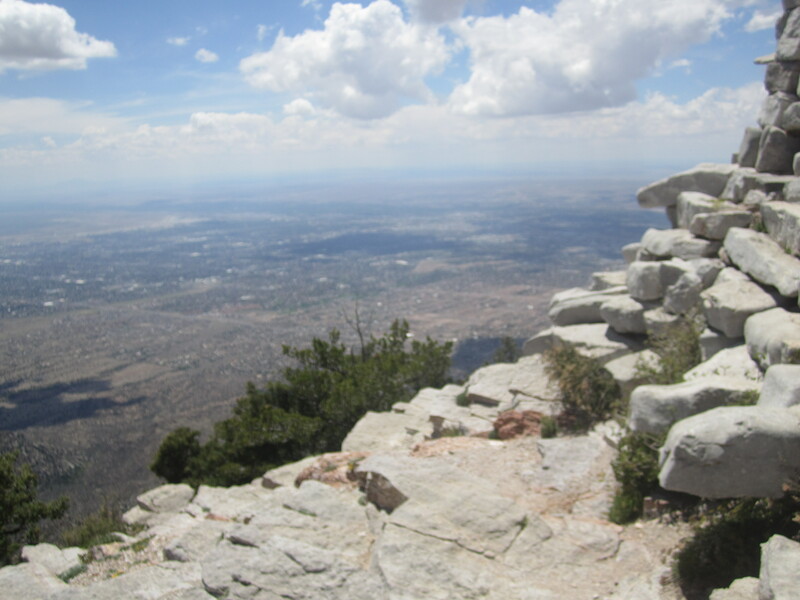 The range dominates views to the east from Albuquerque, reaching well over 10,000 feet and offering multiple life zones in which to hike. So when I had a brief window of time to visit the area with my bride, I jumped at the chance to take what is advertised as the world’s longest tram ride. We arrived about noon and had to wait 20 minutes for a ride. 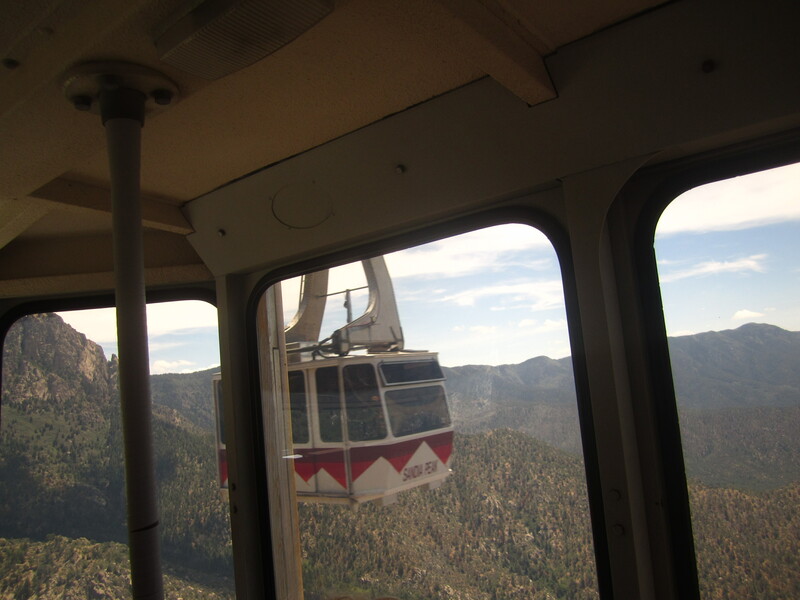 50 people crammed into the tram and listened as a guide gave us a play by play of the scenery, pointing out Totem Pole Rock, Echo Canyon, and more, giving information and adding plenty of wit. It was a good ride, taking about 15 minutes. Views the whole way were amazing. The top itself was sublime, a long rocky and well treed ridge. I almost salivated at the thought of hiking all over. 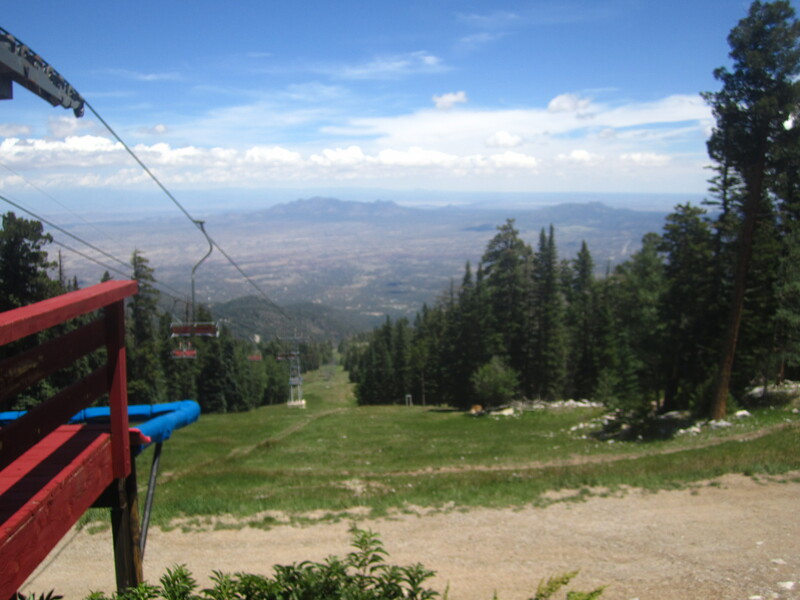 I learned that the back side of the Sandia range has a ski area, aptly named Sandia Peak. A long and winding road climbs all the way up to access it, but it takes over an hour. I like our route better. Either way, the views are stunning. The tram’s upper terminal. Don’t drop your keys here…. It was slightly amusing that there was a full service restaurant on top (supposedly the nation’s highest), which reminded me of a restaurant (since destroyed by avalanche) perched on top of Bridalveil Falls in Utah which I’d visited ages ago. That felt out of place, and so did this, but what the heck. We would later eat and drink there after hiking. So much for snobbery. I must be getting soft. 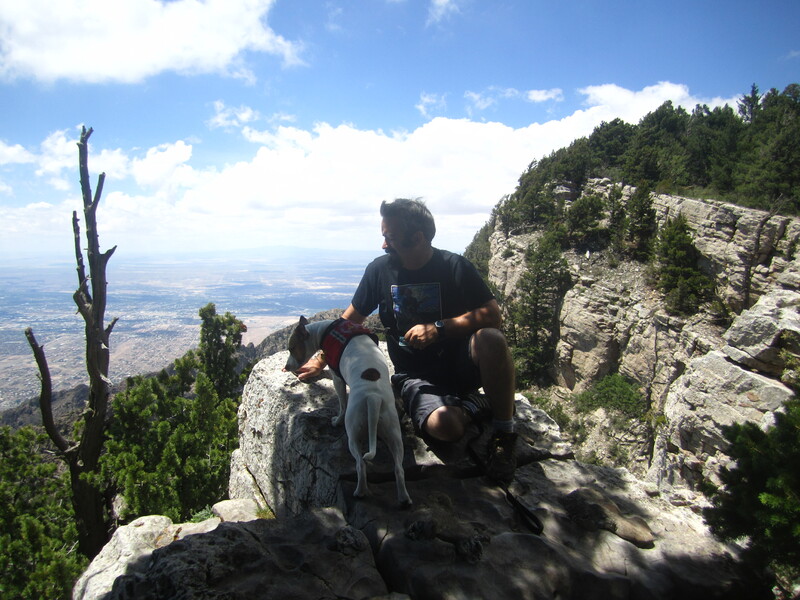 All in all, it made for a happy man before I even set foot on the Sandia Crest Trail. 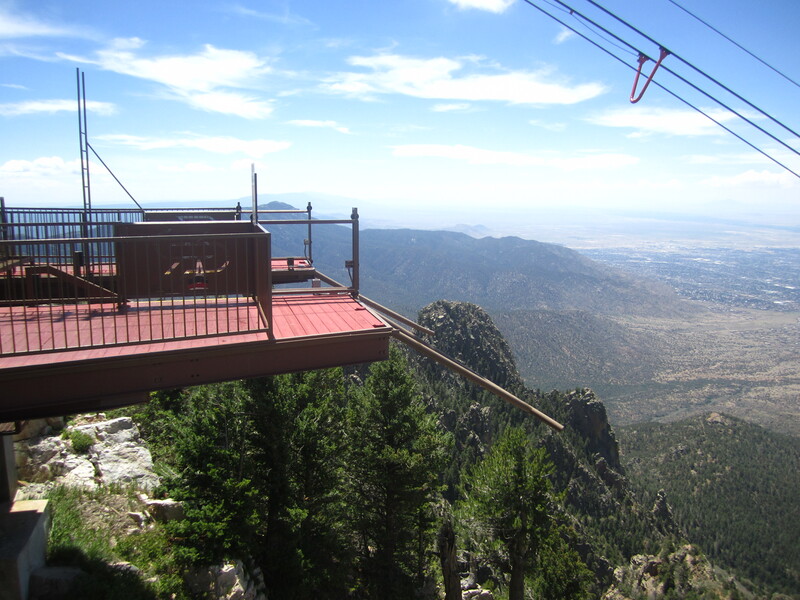 The top of the Sandia Range offers a beautiful environment, completely different than the high desert below surrounding Albuquerque. The temperature up top must have been at least twenty degrees cooler, and the ridges were was cloaked in pines, maples, and aspens as well as a lot of rock. This turned out to be an almost perfect day. Stay tuned for more.